Correct me if I'm wrong in assuming that Warner Bros. never compiled musical highlights. Metro and Fox did, MGM to best effect with 70's and later That's Entertainments. Industry and fans conceded to theirs being always ahead in terms of melody-making. 20th's effort was a copy, made for television, and hosted by Fred Astaire, whose only association with Fox had been Daddy Long Legs. WB could have assembled a feature on basis of Busby Berkeley's work alone (there were a few shorts), 60-70's cult for which put him top among "camp" names. 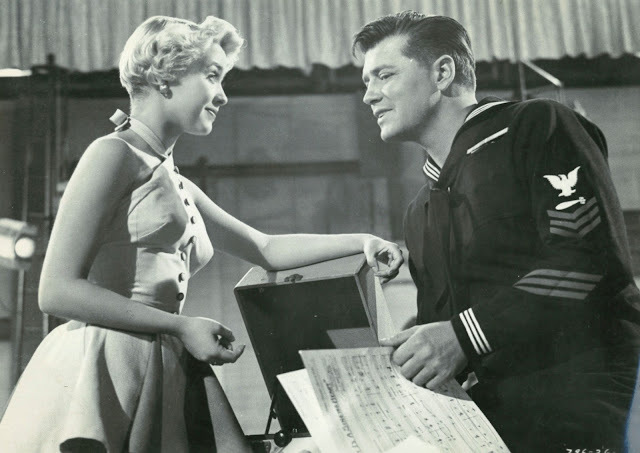 Little such stardust attached to later WB musicals, however, the 40's weighed by series (Dennis Morgan-Jack Carson) mimicking elsewhere ongoers (Hope-Crosby) that registered better. 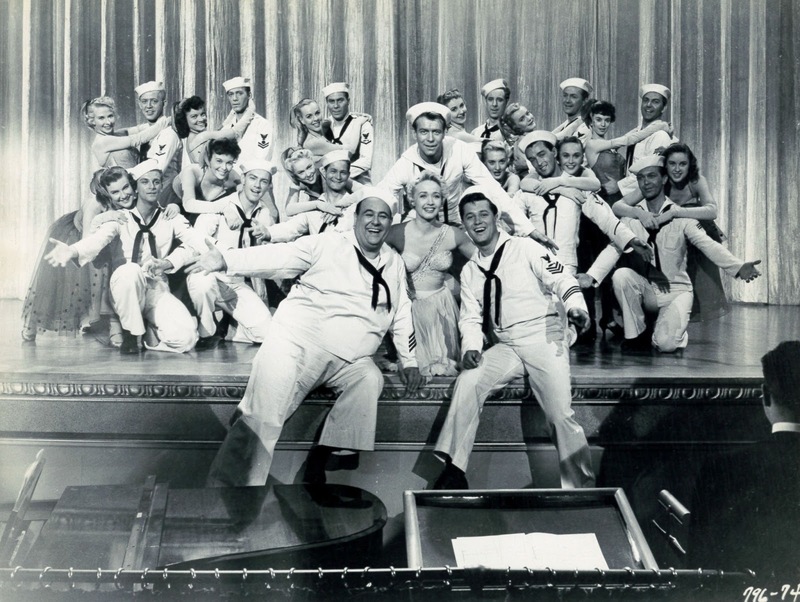 On-lot talent lacked aptitude for musicals, this almost central joke of wartime revue Thank Your Lucky Stars, where stars that sang invited us to laugh at their breaking habit to do so. Warners would get serious about song/dance with discovery/development of Doris Day. To her progress would come assist of Gordon McRae and Gene Nelson. 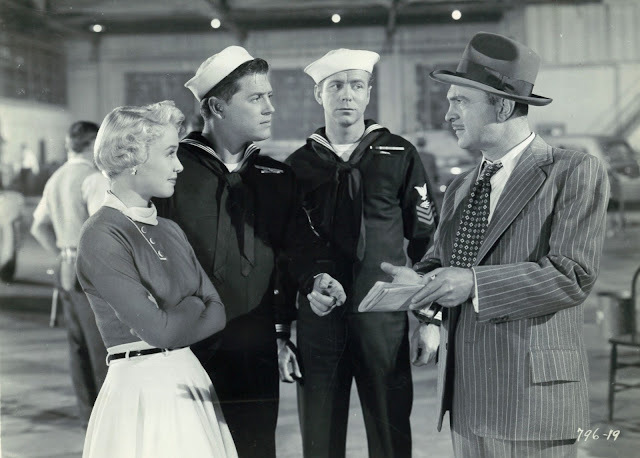 Three Sailors and A Girl, minus Day, was strictly road company beside MGM's On The Town, which it emulated to a degree, as did Universal with sailor-suited Tony Curtis observing So This Is Paris (no it wasn't, being backlot lensed), plus All Ashore's (Columbia) cut-rate nautical trio, headed by Mickey Rooney. These were strictly ersatz beside Metro, at least comparatively so. 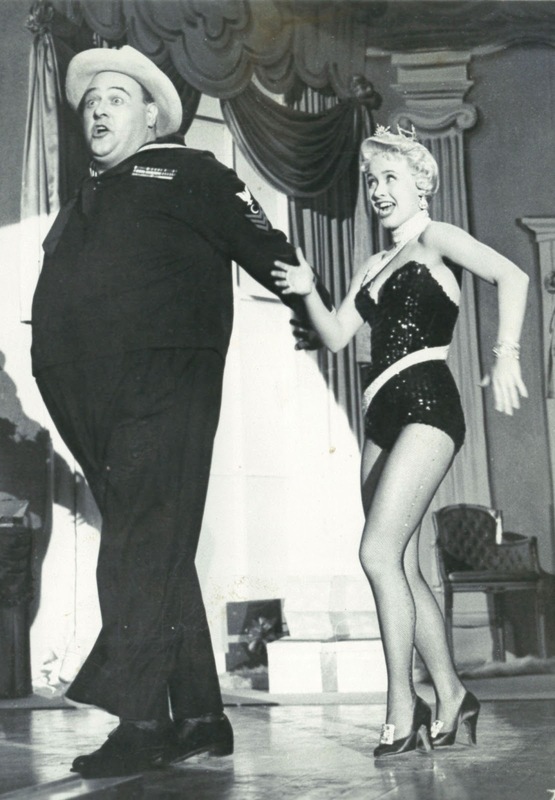 By themselves, it was possible to get by, as did Three Sailors and A Girl, released in late 1953 and stretched for suddenly widened screens unbecoming to head-to-toe performance by a dancing cast. What thrill derived from Gene Nelson tapping where his feet were cropped? MGM had inarguable lead in the race for musical primacy, but a number of theirs lost money thanks to so much poured on (The Bandwagon for instance, a 1953 release). Three Sailors and A Girl, along with similar others, could profit more by spending less. Likely largest tab for Three Sailors and A Girl, as least in cast terms, was borrow of Jane Powell from MGM. She's not flattered by the switch; makeup, hair, costuming all cruder applied than loving care dealt by Leo. Co-stars might have wished they could return with her to Culver, Gordon McRae not getting chance at a really top musical until Oklahoma, done independently a couple years later. Gene Nelson would languish as well at Warners, a third wheel, if that, or mere dancing specialty. 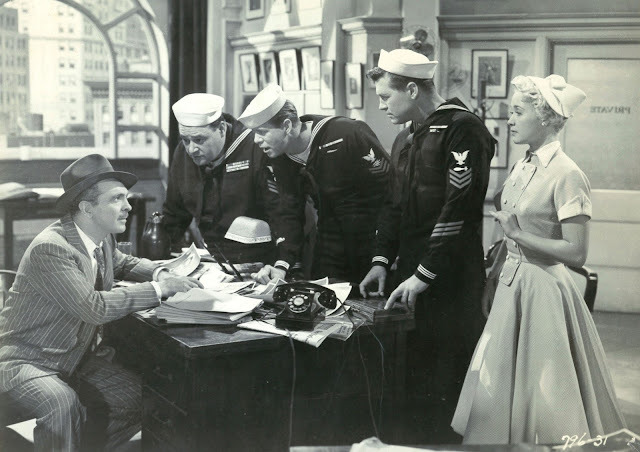 He doesn't get the girl, any girl, in Three Sailors and A Girl, being little better served than comic support "Fat" Jack Leonard, third among titular gobs. What Warner did have was Ray Heindorf as Music Director, his credit a most meaningful in all musicals the company did after the war. Roy Del Ruth, megging book portions, might have been David Butler or Gordon Douglas for all of difference it made. Basis yarn had whiskers, The Butter and Egg Man dating back to 20's and inherited by WB among properties that came with acquisition of First National, latter having announced Butter/Egg for Harry Langdon in long-ago silent era. The property, originating on Broadway, was adapted to movies at least thrice before Three Sailors and A Girl, each time shifted slightly to cloud sameness. 50's Warner went back in files for not a few of musicals ... No, No, Nanette redone for Doris Day, Brother Rat back as About Face. Formula thus weighs heavy on the lot, these coming to life only when participants sing/dance. Comedy is less well-served, Leonard left to trade on girth with no shading beyond. Same for Sam Levene as a producer who crooks the trio out of savings, a part made unsympathetic where it needn't be. Three Sailors and A Girl gives impression of being done on a stopwatch with all of corners cut, but offers window to Warners on 50's retrench setting. Big help is TCM running it HD, again a tip-over from no-watch to giving Three Sailors and A Girl a go. Whoa, haven't seen this one in decades! Remember staying up late for it on TV in the sixties, expressly to see insult comedian Jack E. Leonard. Was horrified that the younger version of Fat Jack was playing a nice guy! Today, I'd be more interested in checking out Gene Nelson's gig. You're spot on about WB not letting him ever be the leading man. Must have been his Howdy Doody-ish looks and voice, the very features that made him such a terrific average-Joe-fall-guy in that nasty little noir CRIME WAVE. No wonder he headed for the director's chair! "No wonder he headed for the director's chair!" To helm a handful of Elvis movies and the notorious John Agar sci-fi thriller HAND OF DEATH! Love what you said about MacRae and Nelson wishing they could follow Powell back to Metro after this clunker was wrapped up. Love all three performers - but Warner Brothers didn't have a clue how to showcase them properly. The score for "The Desert Song" was glorious - and I once saw a terrific stage version so the property had across the board potential. Warners filmed (and fumbled) it three times, lastly with MacRae in '53. They imported another MGM soprano for the project (Kathryn Grayson). And naturally she and MacRae sang beautifully. But they had to do it trapped in a quagmire of a script. For heaven’s sake, the studio had Doris Day in the 50's, one of the greatest musical comedy stars ever, and only once during that decade did they get it together to present her in a vehicle worthy of her talent. That would be "Calamity Jane". As for "Three Sailors and a Girl", well I'll never understand how they managed to mishandle Gene Nelson's career so badly. A gifted artist who surely would have fared better at MGM. As it happened, he - like MacRae - would get his best screen exposure elsewhere (and in the same film, "Oklahoma!) A final point. 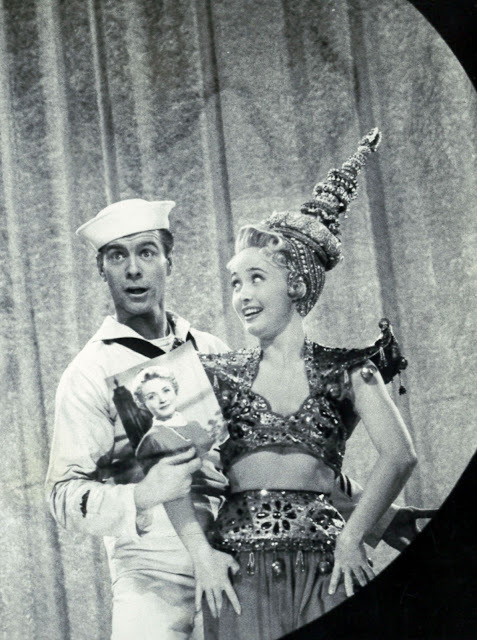 Jane Powell was one of the best things that ever happened to movie musicals. And the honchos at Warner Brothers deserve a swift retroactive kick in the backside for forcing her to sing that god-awful song “Kiss Me Till I Scream”. The only Warner Bros. musical number compilation I can think of was The Busby Berkeley Disc on laserdisc, which saved them having to spend a fortune on dialogue scenes by putting all the Berkeley highlights on a single disc. Correct about Jane Powell. What a doll!